Minimization of wasteful utilization of energy in process plants is only one component of energy management for the so-called Total Site. It has to be done in conjunction with (simultaneously as well as iteratively) optimization of energy generation and supply in the power plants on the site. Therefore, as shown below, we recommend using the Pinch Analysis software along with our Total Site Energy Management (TSEM) software to get the most benefit from the energy related studies. 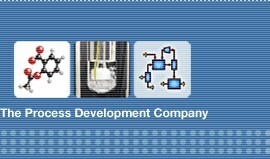 A unique aspect of the software is that it allows the user to select or deselect any number of process plants or segments of a process together and study them together. This flexibility, for example, is especially useful for studying the impact of process modifications on energy usage in a quick and efficient manner. 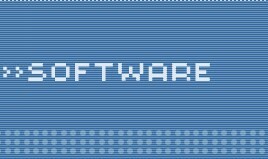 Our software provides a flexible, hierarchical, and user-friendly platform in order to achieve this. 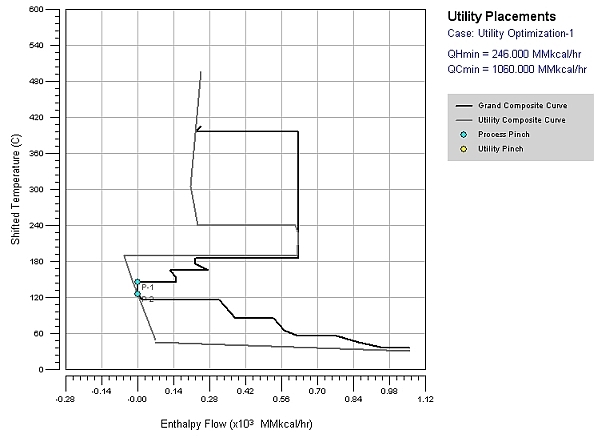 The first step in pinch analysis (after stream data extraction) is to determine the energy targets, i.e. 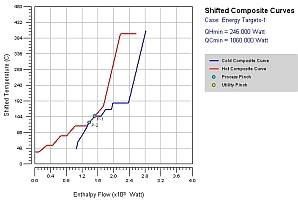 hot and cold utility usage. The targeting case study functions help the user determine the targets, and additionally determine the optimal utility usage. This function enables user to evaluate the inherent energy targets for process plants, and to generate and study the composite and grand composite curves that for the process. The energy targets quantify the best we can achieve and provide a number to aim at. 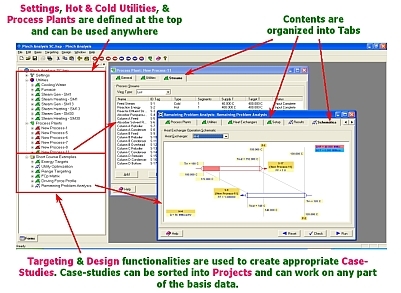 This functionality can also quantify the benefits of integrating one or more process units and penalties resulting from area integrity constraints. 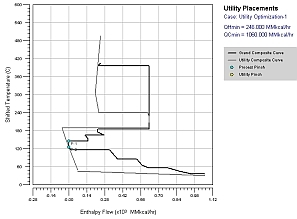 With this functionality the user can (a) determine optimal utility placements using the grand composite curve (b) optimize existing utility usage in process plants and evaluate the opportunities of and benefits from using other/additional utilities, and (c) create and study shifted balanced composite curves and balanced grand composite curve. The choice of an optimum plant-wide ΔTmin can be determined by range targeting. 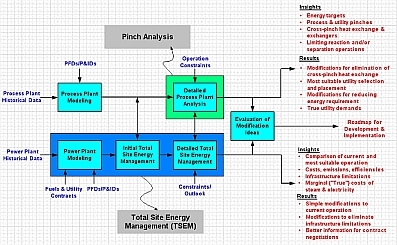 The objective is to quantify how energy targets change with ΔTmin, as also utility placements, optimal usage, and optimal costs change with ΔTmin. After determining the energy targets and appropriate utility levels, the next task is to design a new network or to determine the efficacy of the current heat exchanger network. The design case studies assist the user in this determination. This functionality helps the user select streams that can be matched with each other at the pinch temperatures (on either side of the pinch), when designing modifications to the existing exchangers/heat exchange steps. 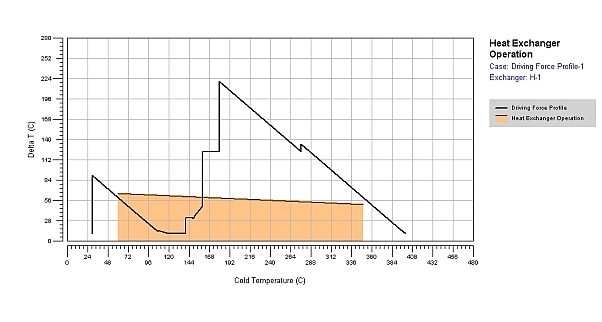 The use of this functionality is (a) to study the inherent driving force as a function of hot and/or cold composite temperatures, (b) to select the exchanger duty for streams which are matched with each other when designing modifications to the existing exchangers/heat exchange steps, and (c) to compare the operation of existing heat exchangers to the inherent driving force profile. 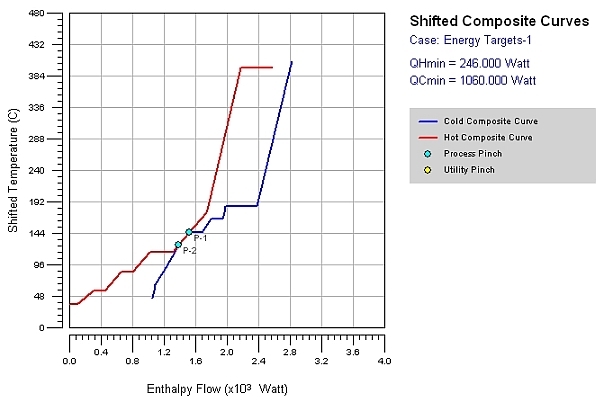 This case study is particularly useful for existing design study because it enables the user to identify the energy penalty from current energy usage and to identify and rank the offending heat exchangers, i.e. to visualize heat exchanger operation and the cross-pinch energy transfers (if any). 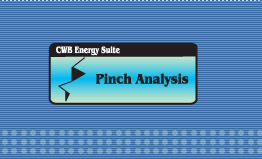 The functionality described above is based on the well-established concepts of Pinch Technology (developed and first practiced by Professor Bodo Linnhoff and several of his co-workers in the mid-1980s) combined with the practical considerations and years of process development experience accumulated within ClearWaterBay Technology, Inc. Defining a Custom Utility — In addition to standard utilities such as cooling water, steam use and generation, hot oil, refrigeration, use can generate a custom utility with its own definitions. 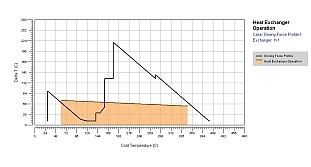 Water & Steam Properties — the software provides direct access to the thermodynamic properties of water and steam. The parameters and methods for calculating these properties are based on the IAPWS Industrial Formulation 1997 of the ASME steam tables (IAPWS-IF97).